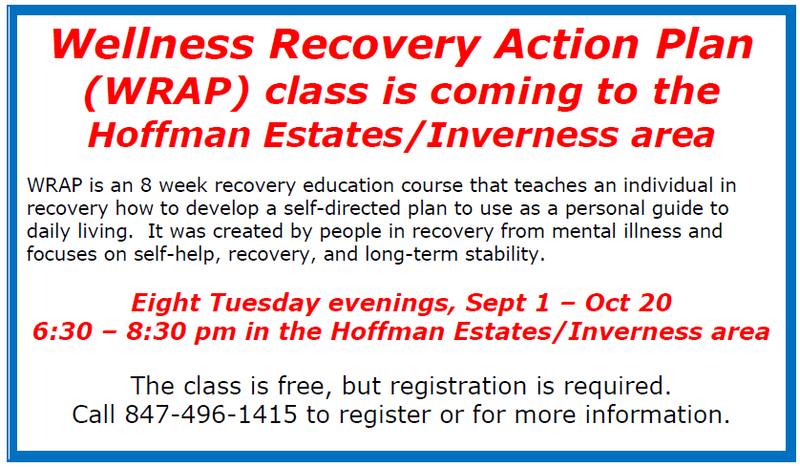 WRAP is an 8 week recovery education course that teaches an individual in recovery how to develop a self-directed plan to use as a personal guide to daily living. It was created by people in recovery from mental illness and focuses on self-help, recovery, and long-term stability. Participants should be 18+ years old and interested in making a positive change in their lives. People with any and all types of psychiatric diagnoses are welcome. WRAP is empowering, effective, and evidence based; time-tested and widely used; and can be applied to many illnesses and issues. WRAP reminds us that it is good to have a plan to help us cope better with life’s challenges, and that we have choices. Learn how to create your own individual Wellness Toolbox, filled with simple, safe ideas to help you feel good, stay well, and feel better even when the going is difficult. Create an action plan for: Daily Maintenance, Triggers, Early Warning Signs, Crisis Planning, and more. The class is free, but registration is required. Call 847-496-1415 to register or for more information. The Nation’s Voice on Mental Illness.